Shoney’s CEO David Davoudpour claims that he, the Shoney’s brand and Shoney’s franchisees are being harmed by disparaging online comments that Shoney’s is a “dead brand” and Davoudpour is a “snake oil salesman” and a “crook and a liar.” If that’s the case, why does Mr. David Davoudpour ignore our offer to set the record straight? (UnhappyFranchisee.Com) Shoney’s North America LLC and its CEO David Davoudpour are being victimized by a bankrupt former Shoney’s franchise owner named Edward Bay, according to Shoney’s attorney Mark S. VanderBroek. Some of those allegedly disparaging comments appear below the UnhappyFranchisee.Com post entitled SHONEY’S Rated a Worst Franchise by Forbes. Do You Agree? It is UnhappyFranchisee.Com policy to never take down comments. However, we have an open invitation for anyone or any company discussed on the site to provide rebuttals, clarifications or other statements for publication. June 6, 2014 we offered Mr. Davoudpour the chance to address the allegations regarding the decline of the Shoney’s brand under his leadership, and questions as to his business ethics. Our request was ignored, and the comments went unchallenged and unaddressed by Davoudpour & Shoney’s for 7 months. After yesterday’s threatening legal letter to Edward Bay’s attorney, UnhappyFranchisee.Com once again offered CEO David Davoudpour a chance to set the record straight. I just read your letter dated February 16, 2015 to Edward Bay’s attorney Vince Taylor, Esq. regarding Internet comments regarding your clients Shoney’s North America LLC and CEO David Davoudpour. Some of these comments appear on UnhappyFranchisee.Com. In your letter and attachment you mention links from YouTube and Facebook pages to the offending statements on our site 8 separate times. I would like to propose, for a second time, a very quick, no-cost way that your client can immediately halt any alleged damage that these allegations are causing to the Shoney’s brand, its franchisees, and Mr. Davoudpour. If you or your client would like to provide a detailed rebuttal to each of the comments posted on UnhappyFranchisee.Com, I will post it in its entirety. Additionally, I will post links to the rebuttal page adjacent to each of the comments you find offensive, so that every reader knows the allegations are disputed or have been disproved by your client. You may then post links to Shoney’s UnhappyFranchisee.Com rebuttal page on YouTube and Facebook, thereby mitigating the allegedly damaging statements throughout the Internet. As a company with (I assume) a marketing department, an advertising agency and a PR firm at its disposal, it would seem like a pretty simple task to provide a compelling counter-argument as to why Shoney’s is a vibrant and growing brand, and that Mr. Davoudpour is a respected and respectable businessperson who enriches the lives of his employees and franchisees, loves our servicemen and women, and gives back to the community. “With all due respect to you and your profession, Mr. VanderBroek, a CEO paying an attorney to go after name-callers on the Internet is a little like a rich boy paying the big kid to threaten anyone who calls him names on the playground. “If Mr. David Davoudpour believes that someone is making untrue allegations about him, I would suggest that Mr. David Davoudpour speak up and set the record straight himself. If Mr. Davoudpour truly cares about his brand and Shoney’s franchisees, and he truly believes that these comments are harming them, why has Mr. Davoudpour ignored my offer and left these statements on the Internet unanswered and uncontested for 7 months (and counting)? 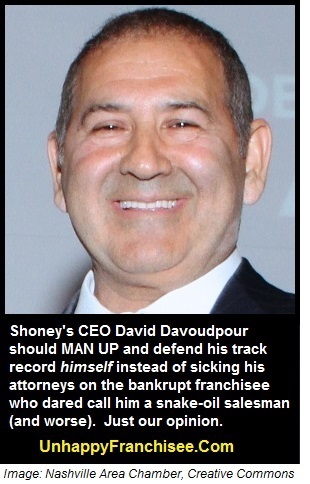 Does Mr. Davoudpour truly believe that his public image is enhanced by choosing to make legal threats against a bankrupt Shoney’s franchisee for comments prompted by Shoney’s inclusion on the Forbes “Worst Franchise” list? With all due respect to you, Mr. VanderBroek, it is my opinion that Mr. Davoudpour’s refusal to respond to his online critics in a direct and open manner is what happens when one misguidedly opts for a legalistic, punitive response to what is essentially a public relations and marketing issue. I hope to hear from you or your client soon. ← 7-ELEVEN: Have NCASEF Board Members “Sold Out” 7-11 Franchisees? Is it possible David Davoudpour won’t respond because, here is no defense against the truth? Below is a repost of from the original article found here. Clearly, franchising desperately needs Federal Regulation. The new owner has not accomplished anything at all if unit and sales growth are the measurements. Sales reported to Nation’s Restaurant News in July 2012 reflect a $ 200.000.00 drop in average unit volume from sales reported to the Nashville Tennessean in January 2007. I don’t find any record that Shoney’s has reported sales since then and they do not report sales to franchisees. Recent press releases claim there are 160 Shoney’s, again that number reflects a 122 unit drop from the 282 Shoney’s reported to be in operation when David Davoudpour took control in January 2007, a 43% drop. The number of franchisees who have left the system since 2007 would also approach 50%. The infrastructure at Shoney’s in January 2007 was much larger then the present management staff. In 2007 Dan Dahlen was VP of Marketing, when I left the Director of Marketing was Damon Davoudpour (no evidence was ever provided to show Damon has a marketing degree or any experience in a marketing role outside of Shoney’s). In many Shoney’s markets there were no marketing co-ops. There was no one in a VP of Operations role for the restaurants, no VP of Training, no VP of Human Resources, no VP or Director of Purchasing, all critical to franchise support, all jobs that existed at Shoney’s BEFORE David Davoudpour took over in 2007. During all the years I was a franchisee Mr. Davoudpour never set foot in any of my restaurants. Not a single “New” company-owned prototype Shoney’s restaurant has been built (the Branson MO Shoney’s was replaced after a tornado). Some old buildings were turned into Shoney’s but nothing new from the ground up. The “new” franchisees in the system are individuals who bought existing franchised restaurants. No new franchisees building new restaurants. I think this kind of summarizes why Shoney’s landed on the Forbes list as the 6th worst. I would encourage anyone considering this brand to do lots of due diligence and talk to as many former franchisees as possible before signing a deal. I am sitting in Shoneys San Antonio reading all this corporate intrigue and I say: get over it and run the restaurant like THIS one: clean, friendly staff, the buffet table being well cared for. Come on everybody shake off the cobwebs and stick to basics. The Shoneys at river side dr. Clarksville needs to have an undercover boss come to it. They have the smallest buffet I have ever seen its nothing like all the others ones I’ve been. The food looks like it was dumped out of a can, and heated up. They never get an order right, I order a slim jim, they ask if I wanted it like the original with lettuce and tomatoe I said yes and when I after sitting there a long time I got my order and left when I got ready to eat it it only had two slices of ham one slice of cheese , no dressing ,no lettuce or tomatoe. These people are giving shoneys a bad name. This is the only one close to us. We will never go there again!